From the House of the Dead is Czech composer Leoš Janáček’s final opera, having been left virtually complete when he died in 1928 and premiering two years later. It is based on Dostoyevsky’s eponymous novel of 1862, which describes life, and the experiences of several convicts, in a Siberian prison camp. The piece has never before appeared at the Royal Opera House, and in Krzysztof Warlikowski’s new staging, which represents a co-production with La Monnaie, Brussels and l’Opéra de Lyon, there is much to admire. It is slick, detailed and nuanced, but in its efforts to universalise the opera’s themes something regarding the intrinsically Russian nature of the story is lost. Warlikowski sets the piece broadly in the modern day as he attempts to explore the experiences of prisoners in general. Much emphasis is placed on the philosophies of Michel Foucault, and at the start of the evening we even see him on a screen espousing his theories regarding the relationship between judges and the accused. This is clever because it shows how his thoughts closely mirror the way in which the Prison Governor speaks with the political prisoner Alexandr Petrovič Gorjančikovat the end, as if he is willing the prisoner to reassure him that he is blameless. The production is also arranged in line with Foucault’s theories on power, knowledge, freedom and surveillance. 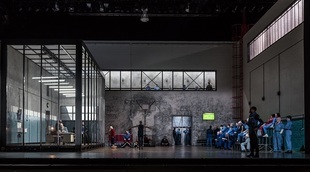 The main set, designed by Małgorzata Szczęśniak, is made to look like a prison gym with an enclosed gangway running above it that means the prisoners can be spied on at any moment. There is also a central box-like area with two opaque and two transparent walls. This can be moved around to form the Governor’s office or the stage for the opera’s ‘play within a play’. There are a host of innovations so that a wounded eagle that the prisoners discover and eventually nurse back to health is here a basketball player who is actually injured by a prisoner at the start. The bird’s final release and ascent to the skies is then symbolised by another member of the player’s team climbing a ladder at the end. However, Dostoyevsky based his novel on his own four-year long experience in such a camp, with many of the incidents it describes being based on ones he witnessed. As such, although there is much to be extrapolated about the lives of prisoners and power relations more generally, the writer was describing something both specific and intrinsically Russian in character. The difficulty in universalising the message to the extent that the original context is entirely lost is not merely theoretical. Here, it feels as if we are predominantly looking at individuals who espouse their philosophes in turn, and not at a community of prisoners whose shared setting binds them together. This makes it harder to feel for the characters who, relatively speaking, seem to stand in isolation, especially since it is not always easy to keep track of them. 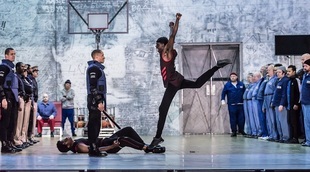 The opera can feel difficult to follow because there are so many characters, and while the director’s job should be to make it easier for us to do so by enabling us to see where everyone fits within the larger picture, Warlikowski’s quite deliberate decision to downplay the Russian context works the other way to make it harder. As a result, the production in some ways actually sanitises the opera. This is not because it often uses bursts of red confetti to depict blood, which in this context is a sound directorial choice. 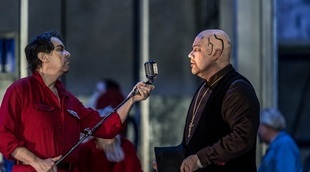 However, having a Russian Orthodox priest appear intermittently, at one point blessing a murderer during Act II’s ‘play within a play’, reduces the figure to a mere symbol when there is a place for exploring in detail the hold that religion had over people’s lives, and the role that the church played in supporting the State and prison camps. If the staging might still be classed as a qualified success, the evening’s musical credentials are exceptionally strong with conductor Mark Wigglesworth entirely capturing the essence of, and numerous nuances within, Janáček’s enigmatic score. The large ensemble cast is also excellent with Štefan Margita’s Luka Kuzmič, Nicky Spence’s Nikita, Alexander Vassiliev’s Prison Governor, Sir Willard White’s Alexandr Petrovič Gorjančikov, Graham Clark’s Antonič, Ladislav Elgr’s Skuratov, Peter Hoare’s Šapkin and John Graham-Hall’s Kedril all standing out in particular. The most engaging performance of all, however, comes from Johan Reuter as Šiškov as he recalls the series of events that led him to end up actually murdering his wife.